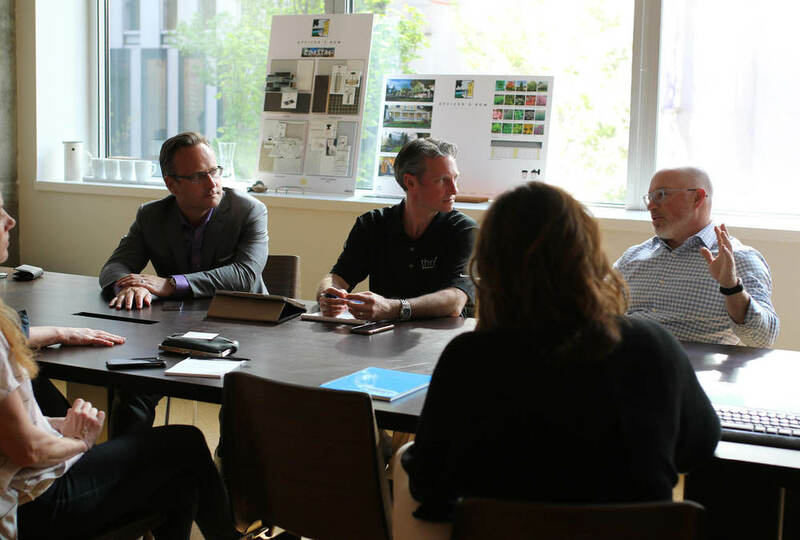 Last Thursday, a collective of representatives from the Fort Lawton sales and development team convened at GGLO to prepare for the first in a series of exclusive salon events available only for Officer’s Club members: the Design Preview. On April 26th, members will gather in an intimate environment to converse with the interior design and development team, review and compare floorplans, and examine finishes and appliances while they eat, sip and ask questions. The evening will be framed by discussions from key development team members including Michael Wishkoski, Principal GGLO; Kimberly Frank, Principal GGLO; Mark Sindell, Principal, Director of Business Development; and Jennifer Stormont, Lead Residential Designer for The Homes at Fort Lawton. Future events will delve deeper into design and restoration specifics, explore the history of Fort Lawton and what it means to live in a nationally landmarked neighborhood, and offer a reservation process prior to the public sales debut.